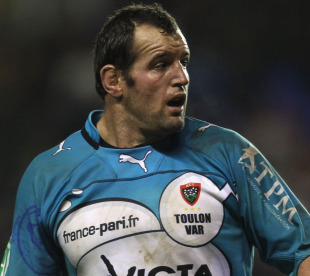 Prop Carl Hayman has received a four-week ban after being cited for a dangerous tackle during Toulon's Amlin Challenge Cup final defeat against Biarritz last Friday. Former Newcastle and New Zealand Test prop Hayman was yellow-carded by referee Wayne Barnes following the tackle on Biarritz wing Taku Ngwenya. Hayman's suspension means he will miss Toulon's bid to be crowned French champions this season, starting with tomorrow's quarter-final clash against Racing Metro. The first three weeks of his ban will expire on June 10 - a day after the French Top 14 final - with a further week to be served over the period of Toulon's first pre-season fixture in late July. Independent judicial officer Christopher Quinlan QC took evidence and submissions from Hayman at a hearing in Dublin today. Hayman accepted he had committed an act of foul play on Ngwenya at the Twickenham Stoop, but argued it warranted a yellow card and not a red. Quinlan disagreed, though, and decided the offence warranted a mid-range entry point of six weeks' suspension. Three weeks were taken off due to Hayman's good record and character, with one week then added as a deterrent for dangerous tackling.